The canopy for the heavy rail trains is coming along quickly. 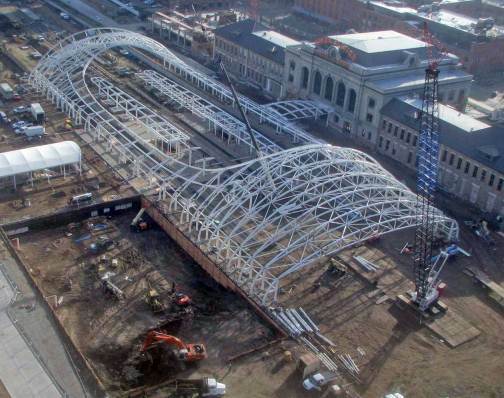 This week the final pieces of the arches for the canopy structure was installed. The commuter rail canopy is a focal point for the project. Additionally, the square piece of land in the bottom left is about to break ground. 1650 Wewatta is going to be a 21 story apartment building developed by Holland. It’s exciting to watch things change daily over there.